When I saw Richard McGary’s vegetable tian, I knew I’d prepare one too. A tian is actually named after the traditional earthenware dish they are made in. There are vegetable tians, meat tians, and fish tians. 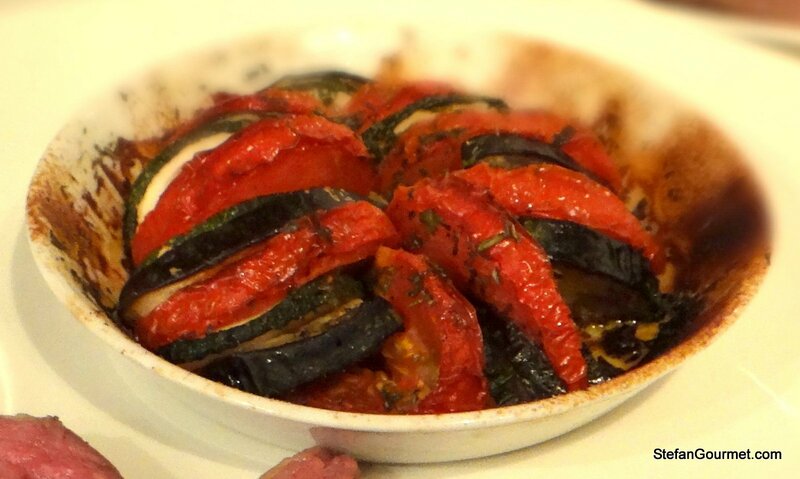 I wanted to prepare a tian as a side dish, and so I chose a very traditional tian provençal with eggplant, zucchini, and tomato. Don’t let the simplicity fool you: this tian bursts with flavor anyway thanks to the slow roasting and the herbes de provence. I do not own an actual tian from Provence. For presentation purposes I opted to make single serving mini tians using small ovenproof dishes, but that did mean that it was more difficult to neatly arrange the sliced vegetables. 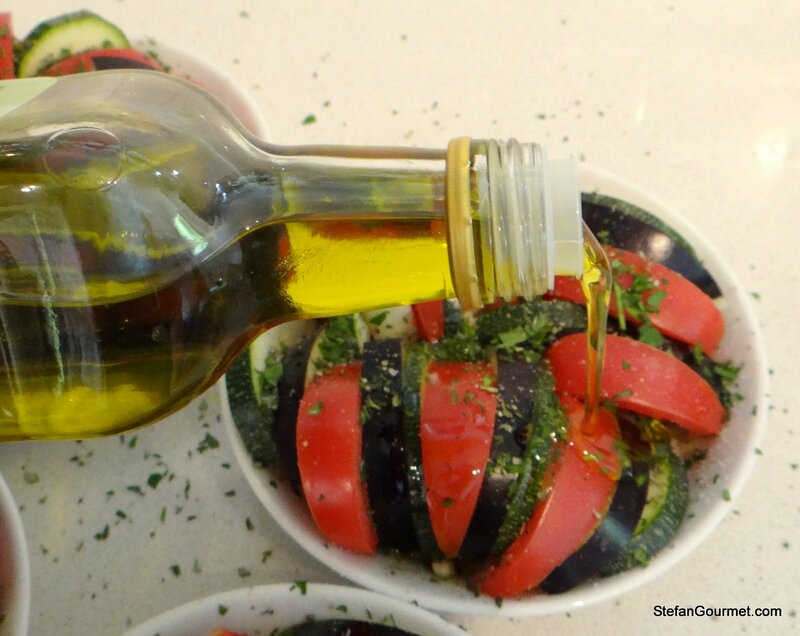 Rub the oven proof dishes (or a single oven proof dish, preferably a real tian 😉 ) with olive oil. 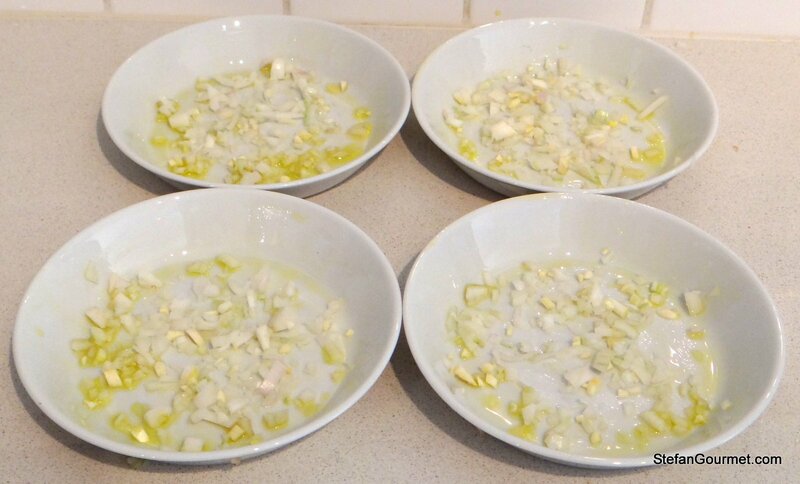 Arrange the onion and garlic in a single layer. Slice the tomatoes into 16 wedges. 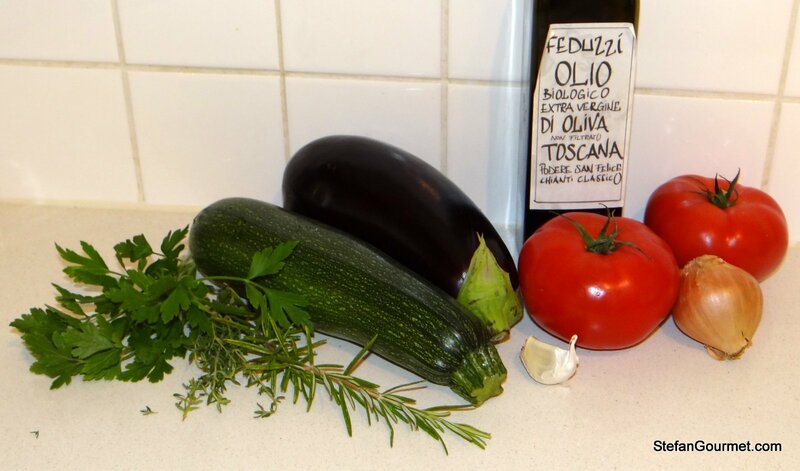 Cut both ends off the zucchini and eggplant. Cut the zucchini and eggplant into 16 slices, and then cut them in half so you’ll end up with 32 slices ech of eggplant and zucchini. 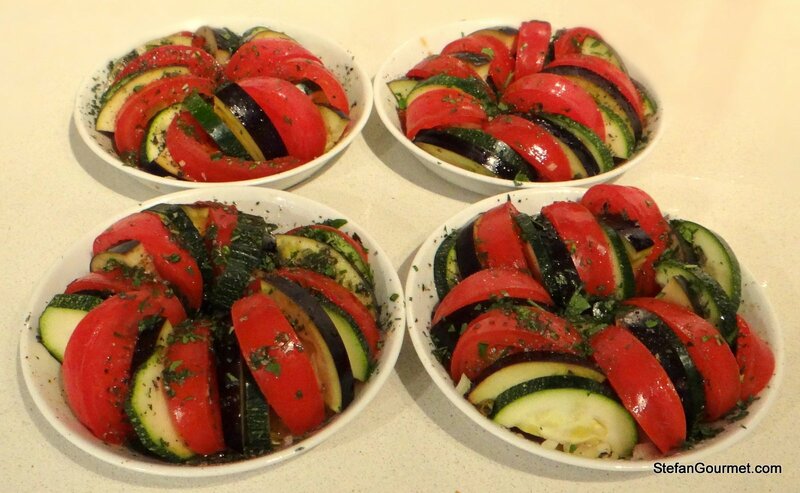 Arrange the tomato, eggplant, and zucchini alternatingly in the oven proof dishes. Mix the parsley, thyme and rosemary to create fresh herbes de provence. Sprinkle the tians with the herb mixture. Bake the tians at 180C/350F (without fan) for 90 minutes. Thanks for saying that — I was a bit worried the picture of the finished tian didn’t come out very nicely. Looks great! I bet this was very tasty and I love the individual servings. Maybe some day I will break down and buy a Tian from Provence so I can be “authentic.” First, however, we need to make Pastel d Choclo (corn pie), a Peruvian dish, because Elia received a paila (an earthenware dish) used to make Pastel de Choclo. It will be a fall post once it cools down a bit. 🙂 Maybe we’ll wait for your visit in February. 🙂 That would be even better. What a lovely dish! The colors are just fabulous. I will have to do more research on a Tian as I have never heard of it before. Thanks for sharing Stefan! Stefan, why would you bake them with the fan off? With the fan on, the veggies would dry out more. The main reason for specifying that the time and temperature are for fan off though, is that the time and/or temperature with fan on are shorter. I’ve noticed that many recipes do not specify this, although the difference is substantial. is basically the difference between cooking in a convection oven and a regular oven, right? my oven is a regular one. Interesting names, because both use convection to transfer heat to the food. In a convection oven (with fan) the air is moved around by the fan, and so there is more convection than in a regular oven. In a regular oven (without fan or in a convection oven with the fan off) the humidity that evaporates out of the food will stay close to the food and serves as a bit of a ‘blanket’ that makes it dry less quickly. The fan will blow away the ‘blanket’ and will speed up the drying and thus cooking of the food. Some recipes specify to put a bowl of water in the oven to make it more humid. For baking bread using an oven without fan is better. If your oven is a regular one, you may find that sometimes you need longer baking times than indicated in (American) recipes that assume a convection oven. yeah, specially bread. I don’t even time it, because the suggested times don’t get me the results I’m looking for. Same with humidity and browning of the crust.. I monitor all of those things myself, via thermometer, what I see, and what I smell 🙂 Usually what I try to convey on my posts as well. Thanks for taking the time to go over this Stefan! appreciate it. They are probably related. Wouldn’t surprise me if both had a latin origin. These look very nice, Stefan, and I’m certainly going to follow your lead and prepare individual servings when I make this. 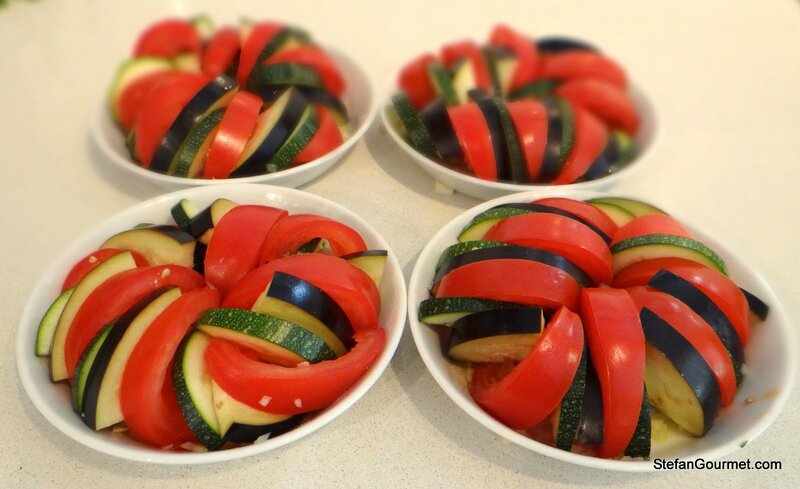 Taking the time to carefully arrange the vegetables is a very nice touch and would not be lost on your dinner guests. And when a dish tastes as good as I suspect this one does, it is definitely a winning combination. Lovely flavours, of course! But I must admit it is the care taken to prepare individual helpings in such a beautiful form which is the main drawcard for me 🙂 !